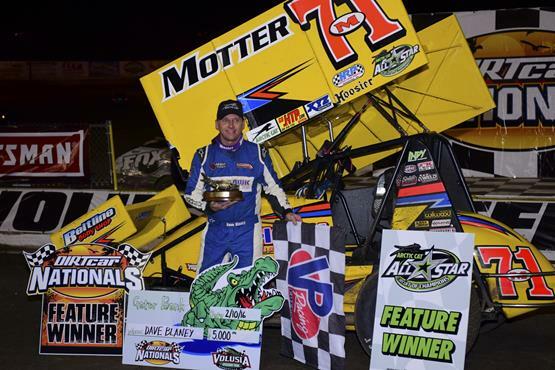 BARBERVILLE, Florida (February 10, 2016) - The “Buckeye Bullet” Dave Blaney capitalized on his outside front row starting position on Wednesday evening and scored the Arctic Cat All Star Circuit of Champions victory at Volusia Speedway Park. The pilot of the Motter Equipment, Motter Motorsports, No. 71M took command of the 30-lap, DIRTcar Nationals main event at the halfway signal and never looked back, surviving two cautions and periods of late-race traffic to score his 47th career Arctic Cat All Star Circuit of Champions victory. Defending World of Outlaws Craftsman Sprint Car Series champion Donny Schatz finished second, followed by Brownsburg, Indiana, native Joey Saldana. After utilizing a unique format, combining qualifying points, heat race finishing points and an eight-car dash, the evening’s starting grid was set. Joey Saldana and Dave Blaney led the 24 starters to green at Volusia Speedway Park. The “Brownsburg Bullet” Joey Saldana took command on the opening lap, setting a torrid pace during the first nineteen, caution-free circuits. After falling to third at the opening green, Blaney worked his way forward; recapturing the runner-up spot from second row starter Greg Hodnett on lap eight. Less than ten laps later, Blaney charged under Joey Saldana at the flag stand, taking control of the field for the first and last time. The main event’s only two cautions, waving on lap 20 and lap 21, would prove to be a benefit for Dave Blaney; utilizing clean air and a very fast, bottom grooved race track to hold off a sixth starting Donny Schatz. After starting on the outside of row three, Fargo, North Dakota, native Donny Schatz made his first appearance inside the top-three on lap 16, taking the third position away from Spring Grove, Pennsylvania’s Greg Hodnett. A lap later, Schatz drove by Joey Saldana for second, resetting his targets to Dave Blaney. After attempting to utilize back-to-back restarts on lap 20 and lap 21, Schatz would have to settle for second, unable to get by the “Buckeye Bullet” during the remaining nine green flag circuits. Joey Saldana would round out the podium finishers after starting third. Greg Hodnett would settle for fourth, followed by a seventh starting Sammy Swindell. The Arctic Cat All Star Circuit of Champions will conclude their 2016 Florida campaign tomorrow evening, February 11, with another round of DIRTcar Nationals action at Volusia Speedway Park. A full Arctic Cat All Star program will be featured on the Thursday evening card, awarding another $5,000 top prize. Pit gates are scheduled to open at 10 a.m. on Thursday morning, with main grandstands to follow at 5 p.m. Hot laps will hit the clay at 6 p.m., followed by racing at 7:30 p.m. sharp. For more information, such as ticket prices and a complete schedule of DIRTcar Nationals events, please visit Volusia Speedway Park live on the Web at www.dirtcarnationals.com.